As a new year begins, the financial media typically is full of speculative commentary about what the coming 12 months will hold for markets. The assumption underlying this content is that someone, somewhere has a reliable crystal ball. The truth, however, is that everyone is guessing. A few guesses turn out to be right. Most turn out to be wrong. And that’s because those making these forecasts fail to account for the random nature of events. Ultimately, it’s not a good way to invest. Everywhere you look at this time of the year, someone is telling you what stocks to buy in 2019, the chances of a recession, the likely path of interest rates and what will happen to currencies. These forecasts are really guesses and are often just a pitch to get you to trade. In fact, Barry Ritholtz sees forecasting as an exercise in futility. Have you noticed how much media commentary about the market outlook is gloomy? We’re told to brace for everything from meltdowns to depression. Part of this is economic, as research shows human beings are wired to give greater weight to bad news than good. This means there’s an in-built market for fear. So much media commentary around markets is just noise. For example, at the start of every year you’ll see articles saying it’s now “a climate for stock pickers” or that “the rules have changed”. Veteran investor and fund manager David Booth has heard it all and provides a refreshing perspective on market forecasting. This section may provide links to the sites of independent third parties which contain information, articles and other material prepared by persons who are not employees or representatives of DFA Australia. These links are for your convenience only. These third parties are not affiliated with DFA Australia, and DFA Australia does not control or endorse and is not responsible for any information, opinions, representations or offers on these linked sites. DFA Australia is not responsible for the contents or accuracy of this material, and the opinions expressed in this material should not be taken to be the opinions of DFA Australia. Global markets are providing investors a rough ride at the moment, as the focus turns to China's economic outlook. But while falling markets can be worrisome, maintaining a longer-term perspective makes the volatility easier to handle. A typical response to unsettling markets is an emotional one. We quit risky assets when prices are down and wait for more "certainty". These timing strategies can take a few forms. One is to use forecasting to get out when the market is judged as "over-bought" and then to buy back in when the signals tell you it is "over-sold". A second strategy might be to undertake a comprehensive macro-economic analysis of the Chinese economy, its monetary policy, global trade and investment linkages and how the various scenarios around these issues might play out in global markets. In the second instance, you can be the world's best economist and make an accurate assessment of the growth trajectory of China, together with the policy response. But that still doesn't mean the markets will react as you assume. A third way is to reflect on how markets price risk. Over the long term, we know there is a return on capital. But those returns are rarely delivered in an even pattern. There are periods when markets fall precipitously and others where they rise inexorably. The only way of getting that "average" return is to go with the flow. Think about it this way. A sign at the river's edge reads: "Average depth: one metre". Reading the sign, the hiker thinks: "OK, I can wade across". But he soon discovers the "average" masks a range of everything from 50 centimetres to five metres. Likewise, financial products are frequently advertised as offering "average" returns of, say, 8%, without the promoters acknowledging in a prominent way that individual year returns can be many multiples of that average in either direction. Now there may be nothing wrong with that sort of volatility if the individual can stomach it. But others can feel uncomfortable. And that's OK too. The important point is being prepared about possible outcomes from your investment choices. Look at Australian share market's benchmark S&P/ASX 300 accumulation index. In the 35 years from 1980 to 2014, the index has registered annual gains of as high as 66.8% (in 1983) and losses of as much as 38.9% (in 2008). But over that full period, the index delivered an annualised rate of return of 11.6%. To earn that return, you had to remain fully invested, taking the unsettling down periods with the heartening up markets, but also rebalancing each year to return your desired asset allocation back to where you want it to be. Timing your exit and entry successfully is a tough ask. Look at 2008, the year of the global financial crisis and the worst single year in our sample. Yet, the Australian market in the following year registered one of its best-ever gains. Now, none of this is to imply that the market is due for a rebound anytime soon. It might. It might not. The fact is no-one can be sure. But we do know that whenever there is a great deal of uncertainty, there will be a great deal of volatility. Second-guessing markets means second-guessing news. What has happened is already priced in. What happens next is what we don't know, so we diversify and spread our risk to match our own appetite and expectations. Spreading risk can mean diversifying within equities across different stocks, sectors, industries and countries. It also means diversifying across asset classes. For instance, while shares have been performing poorly, bonds have been doing well. Markets are constantly adjusting to news. A fall in prices means investors are collectively demanding an additional return for the risk of owning equities. But for the individual investor, the price decline only matters if they need the money today. If your horizon is five, 10, 15 or 20 years, the uncertainty will soon fade and the markets will go onto worrying about something else. Ultimately what drives your return is how you allocate your capital across different assets, how much you invest over time and the power of compounding. But in the short-term, the greatest contribution you can make to your long-term wealth is exercising patience. And that's where your advisor comes in. 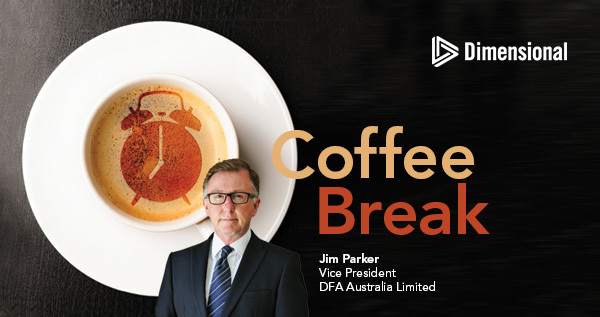 Jim Parker, from Dimensional, has put together a special one-off edition of the Coffee Break brings together some useful perspectives on current market volatility. Deep economic and market analysis are not really what most investors need at times like this. Instead, the most useful attributes are discipline, diversification, patience and self-knowledge. Veteran journalist Jason Zweig, who’s seen it all before, lists five things you shouldn’t do now. Market volatility can be hard to take, but the more attention you pay to day-to-day fluctuations the more your emotions take over. If you need the money tomorrow, you might have cause to worry. But for most of us, there will be many more market cycles to come. So don’t watch. With our exposure to China, Australia has been caught up in the market falls. Dipping into and out of the market may seem tempting at this time, but listen to another veteran financial journalist Michael Pascoe. People who panic only risk making it worse for themselves. Each week Jim shares a few interesting links from the web and is happy for them to be posted here. Before decimal currency, many of us remember our grandparents saying that if you take care of the pennies, the pounds will take care of themselves. These days we have dollars and cents, but the lesson is still the same. Basically, the lesson is that little things count in building wealth. On their own, the details may seem unimportant, but paying attention to them pays off in the long term. This week’s Coffee Break looks at ways of spending less and saving more. While we don’t necessarily endorse everything in these links, they may prove handy as conversation starters. Do you ever look at your credit card statement and find yourself telling stories about your impulse purchases to make yourself feel better? It’s natural to want to rationalise our expenditure. But Carl Richards says we should focus on the numbers themselves as they don’t lie. Saving money begins with understanding what you can and can’t control. Just sticking to essential purchases may work, but it’s also important you don’t put yourself in a straitjacket. In any case, it’s sometimes the little things that have the biggest impact. Small changes in your spending patterns can make a big difference to your savings pile. It may be as simple as giving up buying coffee each day or locking up your credit card for a month. Check out this useful ready reckoner from the Australian Securities and Investment Commission. Wealth Matters: 4 Tax Strategies That Could Make a Divorce Settlement Easier - Divorce negotiations are never easy, and they became more complicated this year, thanks to the tax overhaul. Here are four tips for taxpayers to consider.